King Kong is a great 3-hour epic love story between the beauty and the beast. I can see how the big fella fell for Naomi Watts. She is fine. But I do not see how she fell for Adrien Brody. King Kong looks better. When the blond first meets Kong, she screams when she sees how big he is. When Kong runs off with the blond, a bunch of white men armed with automatic weapons pursues them through the jungle to save her. Interestingly, the search party is led by a Black man. Skull Island is some type of environmental aberration with dinosaurs and amazingly nasty bugs of all types. The natives are zombies right out of 28 Days Later and Dawn of the Dead. They seem to be on some pretty powerful psychotropic drugs too. Kong fights and kills 3 T-Rexes and giant bats. 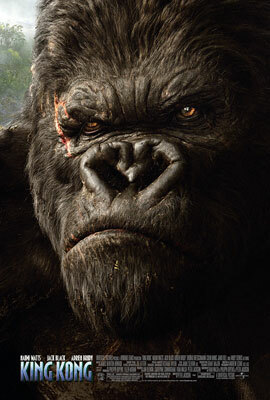 Kong is captured when a bottle of chloroform* is broken on his face and he inhales the fumes. After being exploited on Broadway, he escapes and does a number on Times Square. He wants to find Naomi Watts and any old blond will not do. He dispatches with blonds faster than a cheap New York pimp until Watts finally shows up. Watts was so distraught at the loss of her love at the top of the Empire State Building that I thought she was going to jump too. Of course, the other beast shows up to save her.